I’m amazed at the healing capabilities of Vaseline. My little guy has been suffering (well not really suffering, he doesn’t even seem to notice) from dry patches of skin in the crooks of his ankles and wrists. For about a week, I tried massaging cream into the little creases on a daily basis and the dryness only seemed to get worse. So I resorted to Vaseline. I know it’s greasy and I know it’s messy, but I’d heard that it was a great moisturizer. So I lathered his little ankles with the goo and presto (after a few days and multiple applications each day), the dry skin was gone. 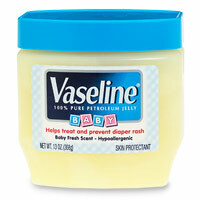 So, once I got beyond the grease and the mess of it all, I discovered that Vaseline really is a great moisturizer. I just kept him in sleepers so he I wasn’t be bothered by the greasy goop that lied beneath. Seeing as the Vaseline trick worked so well on his ankles, I decided to take aim it his pointer finger as well. You know, the one that he uses as a soother? And the moisturizer worked its magic once again: no more flakes, goodbye dryness, hello (semi) normal looking finger. Semi-normal, only because he continues to pacify himself with it on a regular basis.